Kumpai Brewery, a minuscule Kura in Shizuoka City, has recently drawn attention when it won a first prize in Nagoya last year. It is steadily coming up with more, if in small quantities, very select brews such as this one, which is a “Toubin kakoi/斗瓶囲い”, which was conceived for those very special tasting sessions. Taste: Shortish tail. Smooth. Complex. Fruity: pineapple, vanilla, jelly gum. Welcome alcohol. Turns quickly dry inside mouth after sweetish first impression. Overall: For all its concept as a session sake, it is eminently enjoyable with food. Very complex, it would make for the perfect sake to sample in tasting parties. Being a bit “macho” at times, heavy food would not adversely affect it. Every year more local breweries are offering “umeshu” eminently popular in summer when it is most appreciated poured over a few ice cubes! Masu-Ichi Brewery　in Shizuoka City has just entered the fray with concoction called “Denjiro”, which actually is the master brewer/toji’s trade name as he is the second apprentice of Denbei Kawamura, the man who created the Shizuoka Yeast. It contains less alcohol, 7~8 degrees, as compared to the more usual 15 degrees, making it very easy to drink by ladies and younger people in particular. Taste: Shortish tail. Plum taste discreet, not overwhelming. Elegant. Dry. Overall: Makes for a great light aperitif in hot summers! It’s been some time since I tasted a brew from this old favourite brewery of mine, namely Hatsukame Brewery in Okabe Cho. This bottle will remind Etsuko that she has been wanting to check that “Tortoise”! Taste: Short tail. Welcome alcohol. Almonds. bitter chocolate, bananas, coffee beans. Smooth and elegant with alcohol warming up back of the palate. Overall: Typical Hatsukame Brewery sake. Refined, elegant, plenty of character. Great on its own and with food. This particular brew by Eikun Brewery in Yui Cho is a “limited edition” for the summer. For a ginjo, it has a comparitively high alcohol amount. Aroma: Fruity: apples, almonds, melon. Taste: Short tail. Complex. Fruity: green apples, bitter chocolate, melon. Coffee beans appearing later. In spite of its announced dryness, drinks smoothly, almost sweet, especially with salty food. Will turn slightly drier with food with alcohol warming up the back of the palate. Overall: An elegant sake designed for quality food. 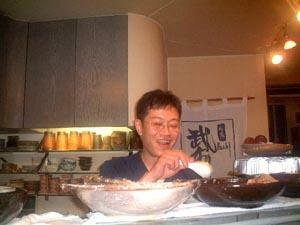 A brew representative of Eikun Brewery. Eminently enjoyable with any food. 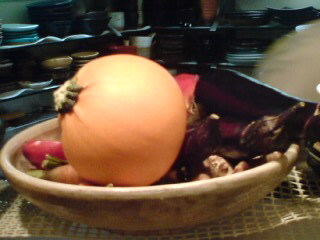 Will reveal many facets according to food variety. The kind of sake you want to boast about! 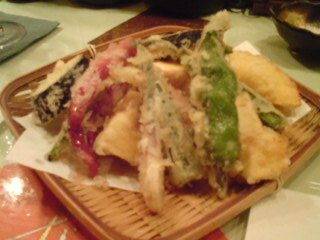 Bu-Ichi Izakaya in Shizuoka City has been a favourite of mine for as long as I can remember. Unfortunately I do not go there that often as it is reserved for my nights out with the Missus (well, too many people know me there, too!)! Incidentally, the picture above was taken quite some time ago. The Oyakata tends to be dressed in white these days, but last night I told him I preferred him in his blue garb! Apart of the great Shizuoka Sake list, a customer will find all the drinks he might want, including wine and Okinawa Awamori. Melinda, Etsuko, don’t worry! I’ll take you there! Tempura and Anago/Conger Eel are two Japanese delicacies known all over the world, but when the two are combined in such delicate, crunchy, succulent manner one just shoud not bother about seasoning or even decoration! Bu-Ichi acquired its fame because of the superlative seasonal sashimi such as “ainame/greenling or rock trout, a rarity brought all the way from Fukushima Prefecture. 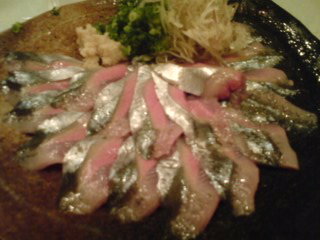 Local fish is represented by “sanma/mackerel pike”. 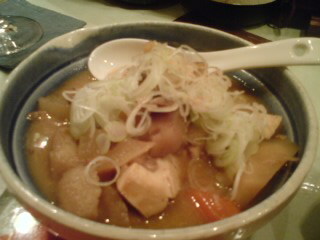 Bu-Ichi serves it in what I think the best way to savour it: thin slices with grated ginger, chopped thin leeks and myoga. The Japanese say “abura ga noote iru”, meaning they are fat. I would translate by “juicy”. The fish just melts in your mouth! They were included in the next Tenpura order. To the Missus’ utter dismay I just ate them with my fingers without bothering about the salt and dip sauce provided! Despite the heat of the day, we could not resist from ordering a bowl of “Gyu-suji-ni”/Beef joints simmered with miso and vegetables and served with a chopped leeks topping. Foodhoe would scream for it! 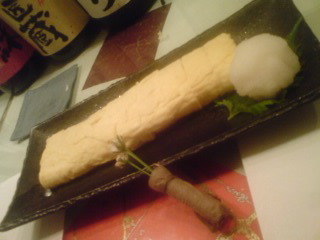 Although we did have dessert in the form of “matcha tea ice cream”, we usually have “tamagoyaki/Japanese Omelette” at the end of a dinner in a good izakaya. Big Bill should see the sheer artistry involved in making such a seemingly easy dish! And the taste! I can guarantee you you would be hard put if you had to choose between a second helping and a dessert! Eikun being a comparatively small brewery, a lot of its brands are mainly sold very locally. I found this particular bottle in their own minuscule shop. Taste: Short tail. Fruity: green apples, bitter chocolate. Smooth on palate. Complex. Very soft in spite of its “nama”/unpasteurized nature. Almonds making an entry when drunk away from food. Overall: Surprisingly smooth for a “nama”/unpasteurized sake. Light and feminine in character. 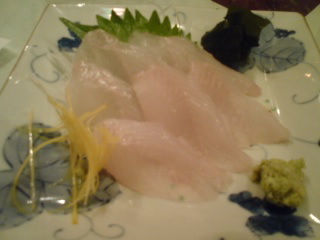 Perfect with food, especially sashimi and vegetables. I just had the opportunity to visit Eikun Brewery perched in the mountains away from any main thoroughfare in Yui Cho (soon to be part of Shizuoka City). Although it has already made itself a name outside the Prefecture this is a small brewery, so I make it a rule to grab whatever interesting stuff I happen to take sight of! Melinda and Etsuko will learn that once again I found another great “futsushu” of ridiculously high value! Aroma: Light. Fruity: Apples, almonds. 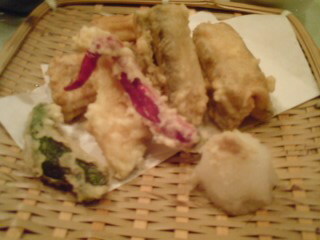 Taste: Short tail (especially for futsushu). Light alcohol. Apples, almonds, vanilla, licorice. Very smooth on tongue and palate. Turns drier after a few sips. Overall: A sake fit for food. I tasted it at room temperature, but should be interesting lukewarm. Drinks so easily. Deep and pleasant taste. Can be drunk at all times of a meal.